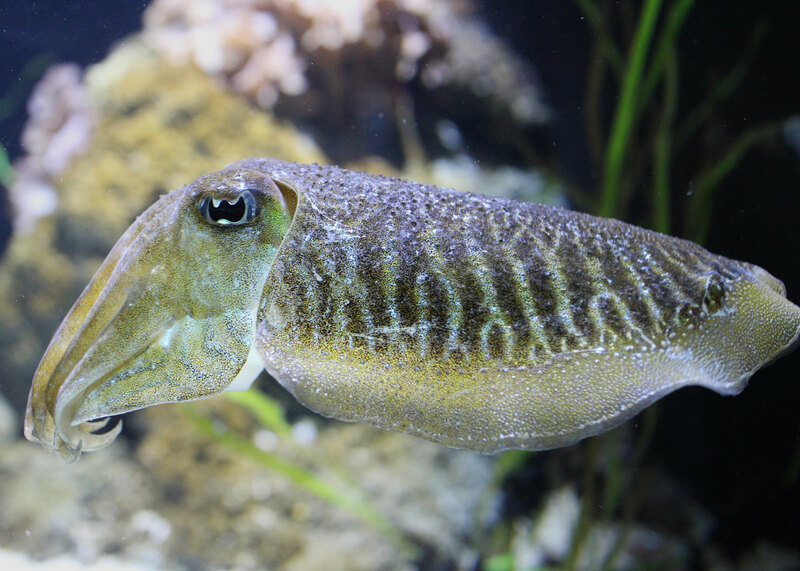 There are four common cuttlefish (Sepia officinalis) in our first floor tropical gallery, including one breeding pair. Aquarist Brianne Dent has observed the protective male chasing other cuttlefish away from his female. For the past several months, Brianne has also observed mating behavior among this pair, and recently a visitor tweeted a video of this behavior. The pair appears to mate at least once or twice a week and has been laying eggs — LOTS of eggs — on the exhibit for a couple months now. 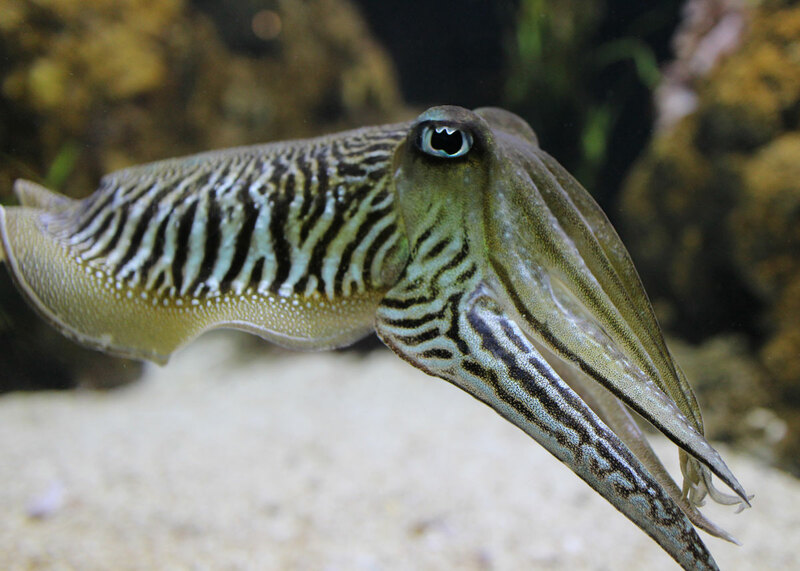 Cuttlefish are capable of laying hundreds of eggs, and females will keep laying eggs until they die. The female lays each egg individually on a hard or sessile structure; in this case, you’ll find the eggs on the grassy habitat in the exhibit. Brianne leaves the eggs on exhibit for a couple days, but then she takes them behind the scenes where they can hatch out protected from the hungry mouths of urchins or jostling cuttlefish. Cuttlefish eggs clinging to the grassy habitat. 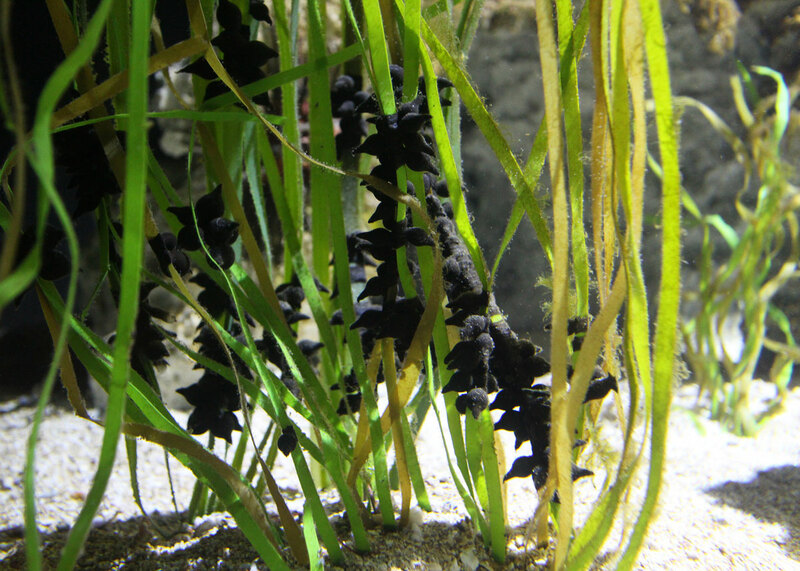 Unlike the pharaoh cuttlefish, which lay white eggs, common cuttlefish eggs contain a tiny amount of ink to make them black. 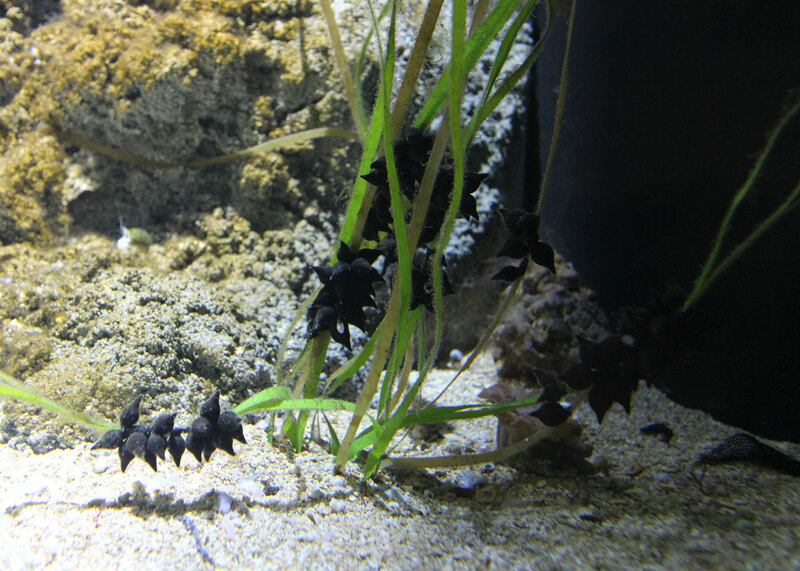 The eggs take about 1 to 2 months to hatch, depending on water temperature. Juvenile cuttlefish are only 0.5 cm when they hatch! There are already many hatchlings growing up behind the scenes (more on that later)! Common cuttlefish lay hundreds of eggs, laying more and more up until they die. The eggs take about 1-2 months to hatch, depending on water temperature. Common cuttlefish live only about a year, and these animals are nearing the end of their life cycle. But now you know the next generation is snacking on tiny crustaceans and growing up behind the scenes. And during your visit to the Aquarium, be sure to keep an eye out for any interesting behaviors and egg clutches in the Cuttlefish Exhibit.